Deadline is Dec. 31, 2018. Maximum word count is 3,000. Judging is blind. All those eligible for USNI membership (or who are already members) may participate in the contest; some prize-winners may be awarded a year of membership. Essays must not be previously published. Simultaneous submissions are not acceptable. Winning essays will also be published in the May 2019 issue of Proceedings, the non-partisan organization's monthly print and on-line magazine. The institute's mission is to "provide an independent forum for those who dare to read, think, speak, and write to advance the professional, literary, and scientific understanding of sea power and other issues critical to global security." The related organizational vision is to give voice "to those who seek the finest Navy, Marine Corps, and Coast Guard." Started in 1878, the essay contest is one of a series of writing contests regularly sponsored and administered by the institute. 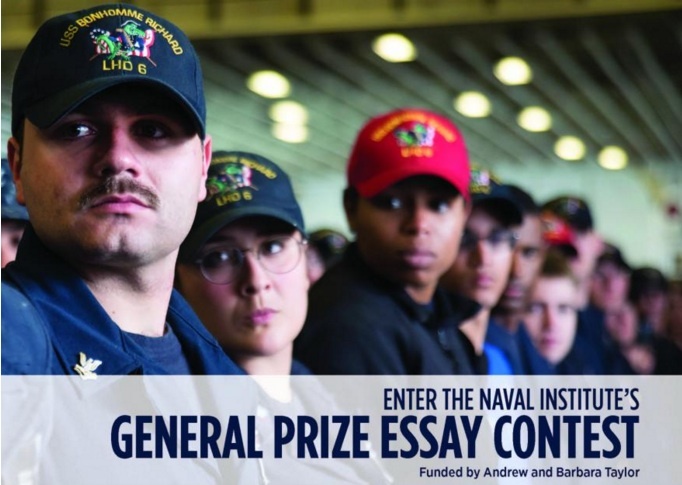 Other recent or current USNI contests include: an Emerging & Disruptive Technologies Essay Contest; a Naval History contest; and a contest for students, faculty, and staff at the Naval Postgraduate School (N.P.S. ), Monterey, Calif.